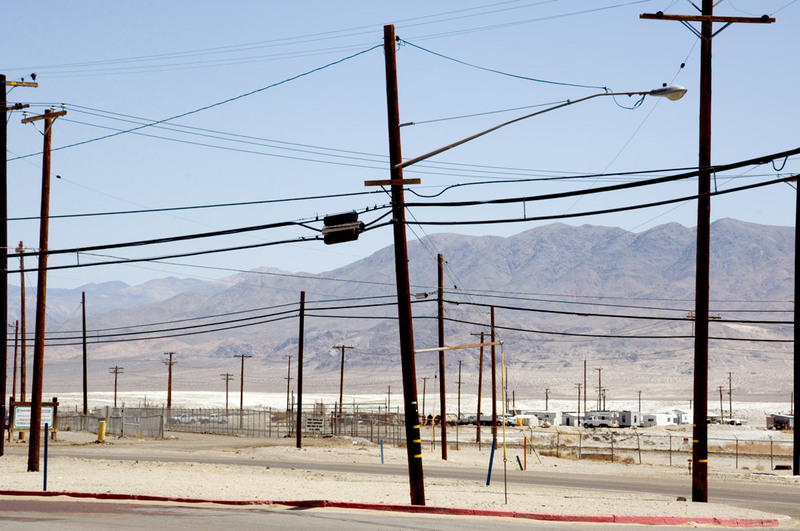 Photolalia: Trona, CA -- Some images... and a few brief words about them. (Trona, CA, 2007. Image copyright Hamish Reid. Click on image above for larger version). It used to be that sometimes when the wind was blowing the right way you could smell Trona from miles up the Trona Wildrose Road, long before you could see the town itself (this was certainly true the first time I drove into Trona a decade or two ago). I don't know if it's still true (the last time I was there I had a cold), but it's a distinctive sulphur smell that seeps into everything from the processing plants and dry lake beds. junk. Driving in through the outskirts of town I'm always mesmerised by the casual junk strewn around front yards, side streets, vacant lots, and the tough bare mountains standing behind the industrial plants. and sometimes everything seems to be held together by those cables, strung between poles, across sandy lots and bare streets, between old wooden sheds and windowless buildings. I think the real problem for me has always been that the place is about atmosphere (in every sense), and that's a difficult thing to get with a short visit here and there and a few snaps left right and centre; it's also about visual juxtapositions that don't work without physical context. Yep. I grew up there (1965-1978). It was a much different town then. Physically, it was as you described; stark beauty and junk. But the people were great. All of that has long since gone. It continues to dies a slow, painful death. hey, did you ever mix with any Trona locals? I'm a freelance journalist--see my bio on a documentary film website, scrapperfilm.com. I'm just starting to follow up leads from last year's dig for additional Manson Family victims. one Dutch-born, Virginia-based professor and a couple of the investigators, county and Park Service who took part in the dig at the Baker ranch site alluded to a Trona link to the disappearance of four German tourists from Death Valley's southwest edge a few years back. I met Cappy, the youngest of The Manson Girls, about ten years ago in Trona. know anyone who might chime in here?